October 1984- July1990: University of Thessaloniki – School of Medicine, Thessaloniki, Greece M.D. August 1991 – September 1992: Rural Doctor, Pentalofos Regional Medical Center, Kozani, Greece. December 1992 – December 1993: Trainee Doctor, 2nd Surgery Division, General Hospital “Asklepieio Voulas”, Athens, Greece. 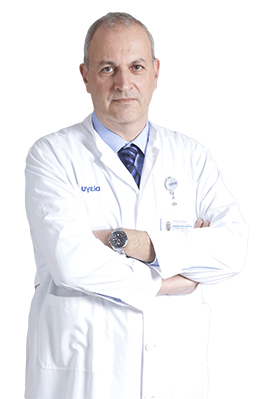 January 1994 – January 1998: Trainee Doctor, 1st Orthopedic Division, General Hospital “Asklepieio Voulas”, Athens, Greece. October 1998- July 1999: Johns Hopkins University – Department of Orthopedic Surgery, Baltimore, U.S.A., Baltimore, U.S.A., Orthopaedic Oncology and Metabolic Disorders, Join Replacement – Fractures. 27 June 2000: Democretus University of Thrace – Medical Department, Komotini, Greece, Ph.D. in Medicine. Thesis: Study of the consequences of pathological fractures during the skeletal metastases of malignant tumors stage on Public Health and Economy (1997 – 2000}. February 2009 – December 2011: Henry Dunant Hospital, Athens, Greece ”Deputy Director of the 1st Department of Orthopedics. April 2005 – January 2009: Henry Dunant Hospital, Athens, Greece 1st Consultant in the 2nd Department of Orthopedics. July 2000 – March 2005: Exclusive Medical Officer in the 2nd Department of Orthopedics. Democretus University of Thrace – Medical Department, Komotini, Greece Ph.D. in Medicine, 1997 – 2000 Thesis: Study of the consequences of pathological fractures during the skeletal metastases of malignant tumors stage on Public Health and Economy. Educational Seminar “TARGON Interlocking Nailing Course”, Athens 26/2/2005. 2nd Shoulder Surgery Seminar with practice-University of Thessaloniki, 1s Orthopaedic Clinic, Thessaloniki 3-4/11/2000. Hip and Knee Joint Arthroplasty Seminar, Athens 19-20/2/2000. 2nd Intermedullary Nailing Educational Seminar with practice,Patra 4-5/4/1997. 2nd Advanced Course – ΑΟ Internatiοnal, 1st-2nd Orthopaedic Departments of Uni-versity of Athens , Athens 23-28/6/1997. Οrthofix Seminar, Bussolengo Verona 7-8/10/1996. 3rd Basic Course for Osteosynthesis –AO International, Orthopaedic Clinic of Uni-versity of Ioannina, Metsovo –Ioannina 21-24/3/96. 8th Seminar for Hip and Knee Arthroplasty, Scientific Society of Orthopaedic Clinics- Asklepeio Voulas Hospital, 21-23/3/1995. 6th Inter-University Seminar for Osteosynthesis, Hersonissos-Herakleio, Crete, 2-5/3/1995. 2nd Postgraduate Seminar- Bone and Tissue Grafting Laboratory-Subject: “ Recep-tion- Processing – Sterilization – Conservation and Using in Reconstructive Surgery” 1st Ortopaedic Department-Asklepeion Voulas General Hospital, Athens 27-29/3/1996. 1st Seminar-Laboratory of Tissue Grafts: “ Tissues Banks and Tissue Grafts Use in Surgery”, 1st Ortopaedic Department-Asklepeion Voulas General Hospital, Athens 27-29/9/1994. Athens Medical Association Award for Voluntary Medical Services in Social Care Mission. M. Drymoussis: Σάρκωμα Ewing’s. Acta Ortopaedica Hellenica:49 (2), 107-121, 1998. Μ.D. Drymoussis, S.A.Lietman, F.J.Frassica: The large Bone Defects Management with Massive Bone Grafting. Acta Orthopaedica et Traumatologica Hellenica: Vol 50, compl. 1: 74, 1999 . Μ.D. Drymoussis, F.J.Frassica: Soft Tissue Sarcoma Management and Local Recurrence as Prognostic Survivor Factor. Acta Orthopaedica et Traumatologica Hellenica: Vol.50, Suppl 1:73, 1999. M.Drymoussis, S. Voutzoulias, N.Triantafyllou: The direct treatment cost of patients with pathologic fractures in metastatic disease. Acta Orthopaedica et Traumatologica Hellenica: Volume 50, additional issue 1:73-74, 1999 (Summary). M.Drymoussis, N.Lagios, J.Vailas, E. Thomas, N.Triantafyllou, A.P.Tsamatropoulos: Results of the pathologic fractures surgical treatment. Hellenic Oncology: 33 (3): 27, July-September 1997 (Summary). J.Kouvaras, M.Drymoussis, N.Kalamakis, T.Spyropoulou, N.Triantafyllou: Comparative Arthroscopic Study of Patella Chondromalacia with Suspect Meniscal Lesion. “Sports and Society” – Faculty of Physical Education and Sport Science of Thrace University. Issue Νο 15, 1996. A.P.Tsamatropoulos, N.Lagios, J.Vailas, M.Drymoussis, E. Thomas, N.Triantafyllou: Total Arthroplasty as limb-sparing method in Orthopaedic Oncology. Hellenic Oncology: 33 (3): 28, July-September 1997 (Summary). M.Drymoussis, M.Dominkus, E.Schwameis, R.Kotz: Adamantinoma: A rare primary bone tumor. Our clinical experience. ACTA Orthopaedica et Traumatologica Hellenica: 51 (Compl.2): 57-58, 2000 (Summary)10. M.Drymoussis, M.Dominkus, E. Schwameis, R. Kotz: Adamantinoma: A rare primary malignant tumor of long bones. Acta Orthopaedica et Traumatologica Hellenica:52(1):71-80, 2001.